In a game that featured a first-half offensive explosion by both teams and a second-half knock-down, drag-out defensive struggle, the upstart Nebraska women’s basketball team gave No. 23 Michigan all it could handle but the Wolverines escaped from Pinnacle Bank Arena with a 69-64 overtime win on Saturday night. The Huskers (12-6, 3-2 Big Ten) led 62-59 before Deja Church’s three-point attempt with 0.7 seconds left in the corner was blocked by Nebraska’s Nicea Eliely. However, Eliely, who blocked the shot on top of the ball with her entire hand and forearm, was called for a foul on the block, and Church sank all three free throws to send the game to overtime. Sophomore forward Grace Mitchell gave Nebraska a 64-62 lead on her driving layup with 4:07 left, but the Huskers were shut out the rest of the way, as the Wolverines improved to 15-4 overall and 4-2 in the Big Ten. Michigan junior center Hallie Thome scored five straight points after being shut out in the second half by Husker freshman center Kate Cain. Thome finished with 13 points and nine rebounds but committed eight turnovers. Cain finished with 13 points, four rebounds, three blocks and two steals. Eliely finished with 10 points, three assists and two steals, while fellow sophomore Hannah Whitish led the Huskers with 16 points and five assists. For the game, Nebraska hit 45.5 percent (25-55) of its shots, including 8-of-22 three-pointers. None were bigger than back-to-back threes by freshman Taylor Kissinger in the fourth quarter. Kissinger, who did not go through Nebraska’s shoot-around on Saturday afternoon while struggling with an illness, hit her first three with 6:26 left in regulation to cut Michigan’s six-point lead in half at 56-53. Just 41 seconds later, Kissinger tied the score at 56 with another long three. She then hit a cutting Jasmine Cincore on her way to the basket for a layup to give Nebraska a 58-56 lead with 4:30 left. That play stretched Nebraska’s scoring run to 10-0 after a three-pointer by Katelynn Flaherty to open the quarter had given the Wolverines a 56-48 lead with 8:26 left. Flaherty finished with a game-high 26 points. 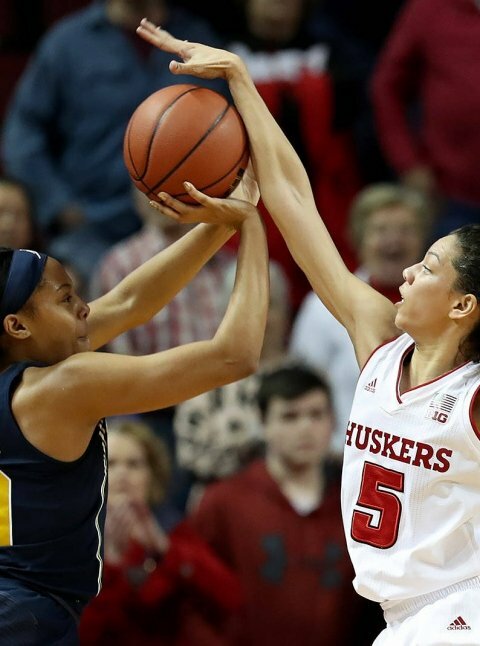 Nebraska capped its run with a free throw by Cain with 1:55 left in regulation to take a 59-56 lead, before a three-pointer by Hailey Brown gave the Wolverines their only other field goal of the fourth quarter to tie the game at 59 with 1:20 left. The Huskers then got 1-of-2 free throws from Whitish with 1:10 left, before Whitish sank a pair with 21.3 seconds left to match their biggest lead of the game at 62-59. Church, who hit the free throws at the end of regulation to send the game to OT, also scored the final two points of overtime at the line to finish with 10 points. As a team, Michigan hit 15-of-19 free throws while Nebraska was just 6-for-13. The Wolverines also outrebounded the Huskers, 43-22, while Nebraska won the turnover battle, 26-19. Michigan finished 46.2 percent (24-52) from the field, including 6-of-14 from three-point range. In a high-scoring and entertaining first half, the Huskers trailed 48-44 despite shooting 60 percent from the field, including 54.5 percent (6-11) from three-point range. The Wolverines led after hitting 61.3 percent (19-31) of their first-half shots, including 4-of-8 threes. The 44 points scored by the Huskers were their most in a first-half this season, while the 48 points by the Wolverines were also the most allowed by the Big Red in a half this year. Flaherty led the Wolverines with 19 points, while Hailey Brown added nine points and Thome contributed eight. The Big Red answered with 13 points from Whitish on 5-of-7 shooting, including 3-of-4 threes, while Eliely pitched in 10 points and Cain contributed eight points. The Huskers played Michigan possession-for-possession in the first six minutes, trailing 16-15 after a transition layup from Whitish. However, Nebraska committed three straight turnovers and Michigan cashed in with a 9-0 run to take its biggest lead of the quarter at 25-15. Whitish hit back-to-back threes to end the quarter to pull Nebraska within 30-23 heading to the second period. Whitish’s second three started a 9-0 run that covered the first two minutes of the second quarter and trimmed Michigan’s lead to 30-29 on Eliely’s layup with 8:16 left in the half. The 30 points scored by the Wolverines were the most points scored by a Husker opponent in the first quarter this season. The Huskers hung within one on an Emily Wood shot-clock beating three with 5:31 left to make it 35-34 Michigan, but the Wolverines took a four-point lead to the locker room. After all of the scoring in the first half, the teams played Nebraska’s lowest-scoring combined quarter since the start of the quarter system, as Michigan held a 5-4 edge in the fourth quarter as the two defenses dug in and shut down both offenses. Michigan took a 53-48 lead to the final period. Nebraska continues its two-game Big Ten home stand on Tuesday by playing host to No. 18 Iowa. Tip-off between the Huskers and the Hawkeyes is set for 7 p.m. with tickets available now on Huskers.com. Nicea Eliely was called for a foul on this last-second block.